I’ve been inspired lately by all of the Pokémon variations and breeds on my dash, so I decided to make some of my own for one of my favorite lines! Here you can see some various breeds of Pumpkaboo, as well as the versions of Gourgeist that they would evolve into. These were a lot of fun, I’d love to hear everyone’s favorites! They're all amazing. I'd have to say that my favorites are Nightlight, Fancy, Hollow, and Sprout for Pumpkaboo; and Midnight, Witch, Cyclops, and Rooted for Gourgeist. I like the Spooky and Doll a lot, but my absolute favorite has to be the final Frilled/Royal designs. They're so charming and cute and fit so perfectly together! Molten Gourgeist looks AMAZING! Of course the ALL look amazing! my favourite ones are the driftloon and litwick variations. They're so cute! Sorry if it's a dumb question, but what's the difference between a fusion and variation? Anyway, these are cool. The Grimer/Muk and Slugma/Magcargo variants are my faves . Ohhh, cool. Thanks for that . 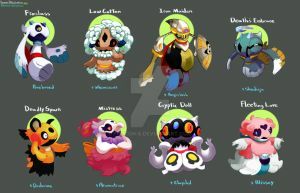 Wowie these are so cool ^.^ i love how you mix up all the pre-evolutions aswell - very creative! I like Midnight and Cyclops best! Cool! You did a GREAT job! These are really lovely designs! It would be so awesome if we could actually mix pokemons in the games. Yeah I know! It would be so fun to see what different combinations looked like. Very cool! I like how you included both stages of the evolutionary chain. Thanks! I thought it would be interesting to consider that they would inherit traits from the evolved forms in their evolutions, as well. You're welcome! I think it's interesting (and logical) too. These all look rad, particularly Midnight and Witch. If you ask me, I personally like to have the Midnight Gourgeist, Witch Gourgeist, Royal Gourgeist and Molten Gourgeist.